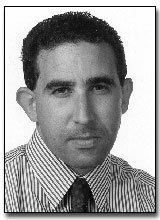 Eric Sondheimer was named Deputy Sports Editor and columnist for the Los Angeles Times Valley/Ventura County edition in September, 1997. Previously, he had been a sportswriter and columnist for the Los Angeles Daily News since 1981, specializing in high school sports. In 1997, he was honored by the Greater Los Angeles Press Club as the outstanding sports columnist in Los Angeles.. In 1988, Eric was rewarded for journalistic excellence by the Associated Press Sports Editors Association with its National Award for Best News Story of the Year. His investigative article on the University of Kentucky basketball program resulted in NCAA probation for the school, and the resignation of the UK basketball coach and athletic director. Eric left the Daily News in 1989 for 17 months to take on a major reporting assignment with The National, America's first daily sports newspaper. When the paper folded, he returned to the Daily News. A Poly High School, Sun Valley and California State University-Northridge graduate, Eric's first book, “College Football's Greatest Games”, co-authored with Fred Eisenhammer of the Los Angeles Times, was published in 1992.